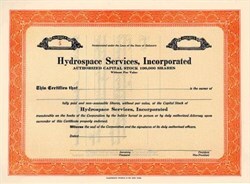 Beautifully engraved unissued certificate from the Hydrospace Services, Incorporated. This historic document was printed by the Hasbrouck Thistle & Company and has an ornate border around it. This certificate is over 41 years old. The company was a joint venture between Phelps Dodge and Northrop Corporation in 1961. The company was acquired by the United States Underseas Cable Corporation in 1966.